Father Iwuamadi, a Catholic priest from Nigeria, is the first Catholic dean in the history of the Ecumenical Institute at Bossey, near Geneva, linked to the World Council of Churches. On June 21, 2018, Pope Francis traveled to the headquarters of the World Council of Churches, to celebrate the 70th Anniversary of its foundation. Then, on July 7, Francis celebrated in Bari an ecumenical day of reflection and prayer for the Middle East with the heads of all the Churches and Christian communities of that region. In this interview with Zenit, Father Iwuamadi analyzes the meanings of these two events and takes stock of the state of the ecumenical journey today. ZENIT: Father Iwuamadi, it has been a few weeks since Pope Francis visited the World Council of Churches on June 21st. You live every day among Christians of non-Catholic churches and communities, at the Ecumenical Institute at Bossey. What impression did Pope Francis and his words leave? It has been a central event in the celebration of the 70th anniversary of the World Council of Churches. He left an indelible mark. His words on the ecumenical reality of today highlighted the joys, hopes as well as the challenges facing the ecumenical movement. An exciting and historic moment indeed! I can tell you that people cannot stop talking about the simple and humble personality of the Holy Father. This is still the talking point among everyone. For my students at the Ecumenical Institute at Bossey, June 21st will leave with them a lasting impression. ZENIT: Can you tell us some concrete reaction to words or gestures of the Pope? I cannot forget the jaw-dropping reaction of the students and staff at the Bossey Institute, when the Pope asked them to pray for him. They were stunned at that. One of the workers came up to me to say what the Pope told them while shaking their hands: “you are all very important.” Even if these were simple and almost informal moments of the visit, I realize they turned out to be the most important ones, especially because in Bossey we also have some Muslims and a Buddhist! ZENIT: Then, the Pope met the heads of all the Middle East Christian Churches in Bari, on July 7th, for a day of ecumenical reflection and prayer… In your opinion, what’s this event’s significance following that of Geneva? Bari highlights once again the pastoral zeal and character of the successor of Peter towards strengthening the brothers and sisters in suffering. Pope Francis has often spoken about the “ecumenism of blood,” referring to the persecution of these brothers and sisters in the Middle East. In our identifying ourselves with them and in sharing their pains, this suffering becomes an eloquent invitation for us to reflect about Christian divisions and a call for unity. 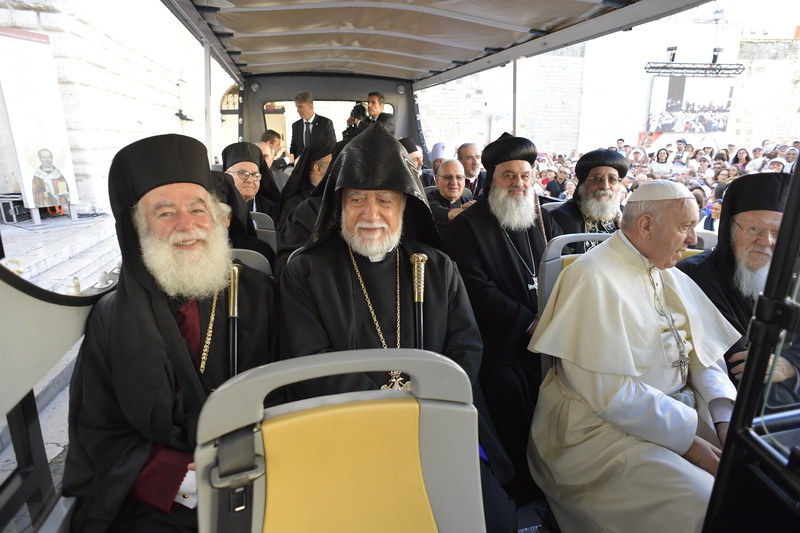 In his address at the ecumenical prayer in Geneva the Holy Father said that walking together “involves being concerned for our traveling companions, since only in company do we make good progress.” I see the ecumenical initiative in Bari as a concrete translation of those words into action. And the presence there of the other Middle East Christian leaders further reflects other words of Pope Francis in Geneva: “our differences must not be excuses. Even now we can walk in the Spirit: we can pray, evangelize and serve together.” Furthermore, I am personally impressed by the choice of Bari and its great ecumenical significance due to the presence of the relics of Saint Nicholas, venerated by both Catholics and Orthodox. In my view the two events, Geneva and Bari complement each other. They provide us with the two different faces of concrete ecumenical engagement in our world today. ZENIT: Pope Francis has indicated “worldly mindset” as the cause of divisions among Christians. “The Ecumenism is a great enterprise operating at a loss,” he said, “but the loss is evangelical.” To what exactly was he referring? The Pope is simply drawing attention to one of the major reasons, though often veiled, that has been and remains at the root of Christian divisions: selfishness, egoism. It is the mindset which seeks to “protect the interest of individual communities” or ethnic identities, that promotes nationalism or party lines. This kind of mindset has nothing to do with the Gospel. It is simply political. It is about power and authority and often times about money. On the contrary, the Pope seeks to promote ecumenism that leaves behind the selfish mindset and therefore operates at a loss. That is the truly evangelical ecumenism, not the ecumenism that proselytizes or that is arrogant and dishonest. The Holy Father refers to ecumenical engagement that works with the sole and honest intention of being instruments in the hands of God in order to realize the will of Christ. ZENIT: Is there, in fact, among Christians the fear that greater openness to ecumenical dialogue can damage the numbers of their own church? Yes. I can say that some churches and ecclesial communities avoid engaging in ecumenical dialogue for fear of losing their members. But first, if the members are properly instructed on the truth of the gospel according to their church tradition, then this fear is unfounded. One should fear only if not grounded in his own belief. Second, with reference to such fear, my experience at the Ecumenical Institute at Bossey proves the contrary. Students who come to Bossey leave the Institute more convinced of their identity and the teaching of their Church traditions rather than losing their identity in the course of their study. Often we hear students say: “at Bossey I rediscovered the faith that my church professes.” In my opinion fear comes up because people are unsure of who they are! ZENIT: And proselytism? Pope Francis, on the plane back to Rome, launched a new warning against proselytism. The Pope is clear about that point. The heart of proselytism is the so-called “sheep stealing”, not the Gospel nor Our Lord Jesus Christ. Proselytism is all about the “worldly mindset” of winning over people, just as in a political election. Here the rule of the game changes. One can say whatsoever and do whatsoever in order to get people to follow him or her to his or her church. But if we recognize our baptism in Christ, then we are invited to avoid any sort of proselytism. ZENIT: The mentality of the secularized world, the world that lives as if God were not there, struggles to accept some Catholic teachings on topics such as life, marriage, family … Other churches offer less severe teachings on these issues (although this less severity does not seem to actually contribute to bringing people closer to a life of faith). How can we overcome the problem of these differences? The appropriate response, I think, is to counter it with the evangelical call to be “light of the world and salt of the earth” (Matthew 5:13). But the major challenge lies in the different perspectives of the various Christian churches and communities on secularization. It looks like some of them are not worried about the consequence of complacency in the face of this reality. The challenge posed by these different opinions could however turn into opportunity for a common witness of the Churches, provided that they will come together and be guided by the eternal truth of the Gospel as their response to it. I agree with the Holy Father. Ecumenism should not be dissociated from the mission of the Church. The central message of post-resurrection mission is “Jesus Christ” risen from the dead. He gives meaning to Christian mission! In committing themselves to that mission, Christians are drawn to the center, Christ, in such a way that they come close to one another. And it is wrong to consider ecumenism as an optional enterprise. It flows from the wish of Our Lord Jesus Christ: “that they may be one”. Fulfilling the wish of Christ is our mission. ZENIT: Ecumenism is a difficult subject to explain to many Christians, who may wonder why – after the journey that has been made together – no concrete results have been achieved … What would you answer? Unity of Christians is God’s project. We are only instruments in the hands of God to fullfill the project. It is not for us to “know the times and seasons” but like the Apostles in Acts of Apostles Chapter 1, we are invited to move on with our commission to do God’s will. At the same time I do not agree that no concrete results have been achieved within these years of ecumenical engagements and dialogues. The Pontifical Council for Promoting Christian Unity for example is currently engaged in various bilateral, trilateral and multilateral dialogues with almost all churches and ecclesial communities of the West and the East. There have been significant progress in the journey towards the visible unity of Christians. There is still a lot to be done and that should be a motivating factor rather than a discouraging issue. ZENIT: Pope Francis has very friendly relations with Protestants and Orthodox. Even in Geneva he received a very cordial reception. But the Papacy for non-Catholic theologians is an obstacle, from certain points of view, for ecumenism. In ’95 Pope John Paul II spoke of readiness for new and different ways of exercising the Petrine primacy, in the Encyclical “Ut Unum sint.” What about those words? It is true, Papacy and the exercise of the primacy of the successor of St. Peter is often and easily evoked in discussions with non-Catholics. But in my work in the field of ecumenism I discovered that frequently the so-called obstacle arises from misinformation and prejudgment, because of non-objective understanding and evaluation of the Catholic theology. The primacy of the Successor of Peter is biblically founded and rooted in the handed on Tradition. It is difficult to objectively oppose this assertion. So I see that the objections are not so much about the primacy, but about the exercise of it. This subject has been taken up in some past and present dialogues. New ways of exercising the Petrine primacy, as mentioned by Pope St John Paul II, could include the various references Pope Francis made on different ways of looking at episcopal collegiality in the Catholic Church. He once said that we can learn “the meaning of episcopal collegiality” from the Eastern churches. In any case I do not think these statements were intended to put the primacy of the Successor of Peter to question.